Fabulous Channel by Giselle Claudino: City of Los Angeles short Movie Fundraiser Cocktail Party Tonight!! City of Los Angeles short Movie Fundraiser Cocktail Party Tonight!! I'm happy to announce that this is one of the projects I am involved in at the moment as a stylist. Doing the wardrobe for movies and photoshoots have began a new career that I'm happy to welcome in my life.I feel blessed - happy and would like to share the experience with all of you! 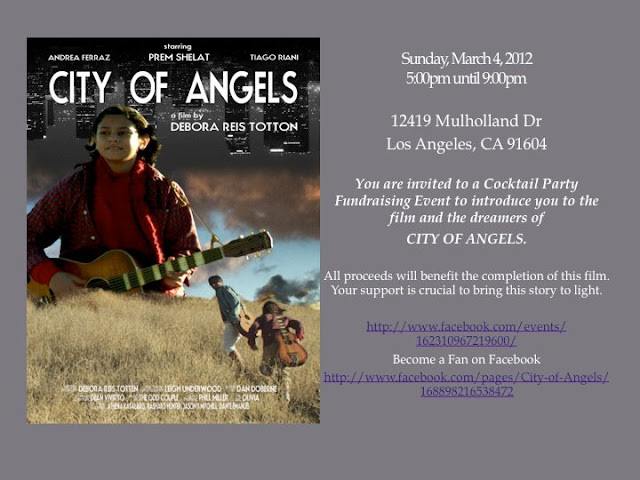 You are invited to a Fundraiser Cocktail Party to introduce you to the FILM and the DREAMERS of CITY OF ANGELS! Where: at Alan Singer's Mansion at 12419 Mulholland Drive Los Angeles Californa 91604 today at 5pm! Meet the cast,crew and director on site. Andrea Ferraz, Tiago Riani, Prem Shelat and much more. Donations must be made at the door! Help the Brazilians to keep dreaming doing what they know best, film-making! Congrats to Debora Reis for the huge idea and execution with this short! It looks fabulous! Come by to this beautiful house for a evening of network ,sneak pick of the movie, wine, appetizers and FLASHES!! For the blogs and networks that are interested in coming tonight to write a piece about the movie and night, you are welcome to get in touch with me so I can put you on the press list!